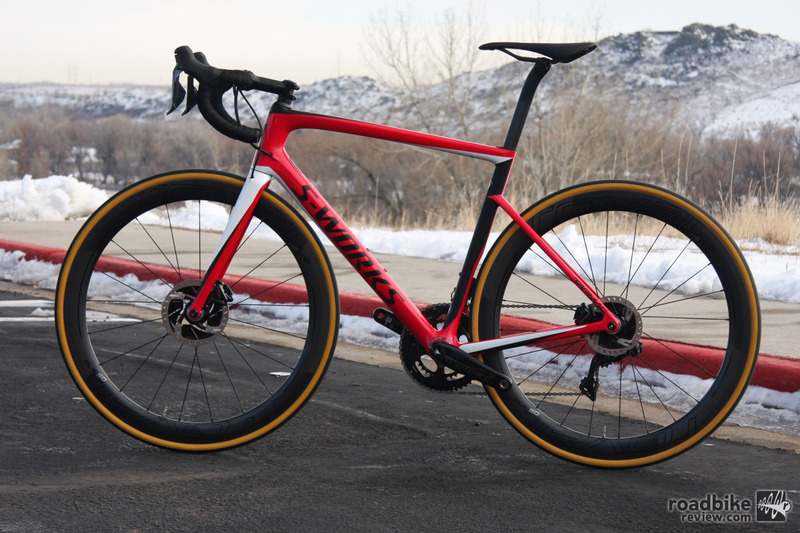 Specialized’s flagship race bike now comes in a disc brake-equipped version. As the WorldTour pro peloton eases ever deeper into disc brake use (just as most consumers did a while ago), it comes as no surprise that Specialized’s flagship race bike is now available with rotors, too. Indeed, the California-based bike maker recently released S-Works versions of its popular Tarmac platform, and we’d expect more budget friendly options are not far behind. Max tire clearance is listed at 30mm. The stock setup is 26mm. 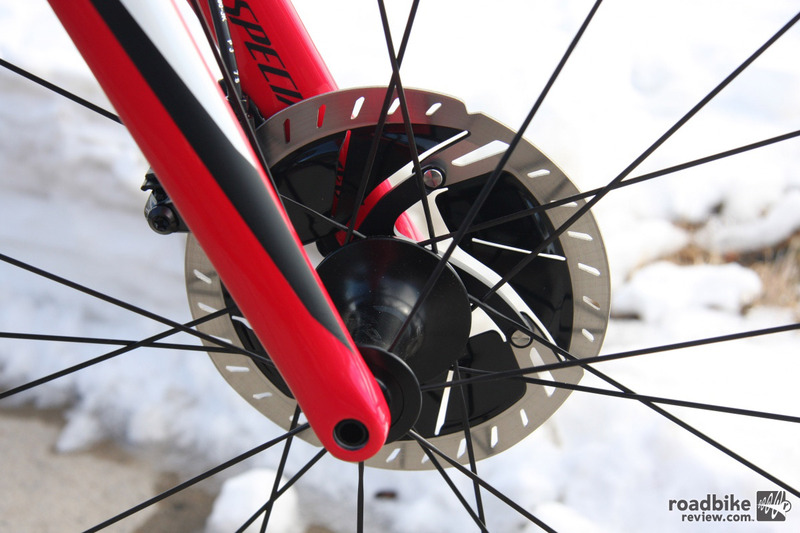 For now, though, you’ll need to pony up a big wad of cash if you want disc brakes on a Tarmac. 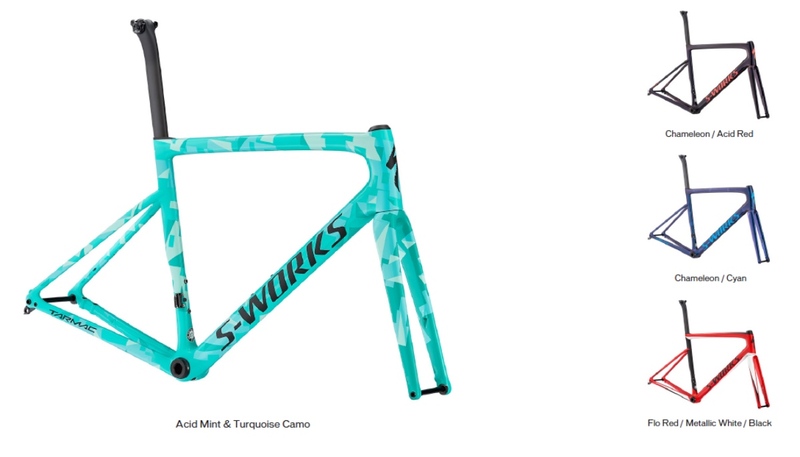 Fully loaded men’s and women’s models both sell for $11,000, or you can opt for frame and fork – $5000 for the ultralight black-silver version, or $4500 for the standard S-Works frameset, which comes in acid mint and turquoise camo, chameleon-acid red, chameleon-cyan, or flo red-metallic-white-black. The full array of frame color options. Before you balk at that complete bike price, know that this top-shelf build includes the new dual-side-measuring S-Works Power Cranks powermeter, which we’ll touch on more in a moment. The rest of the build is highlighted by Shimano Dura-Ace Di2 9150 drivetrain and Roval CLX 50 Disc tubeless-ready carbon wheels. Here are the complete specs for both the men’s and women’s builds. 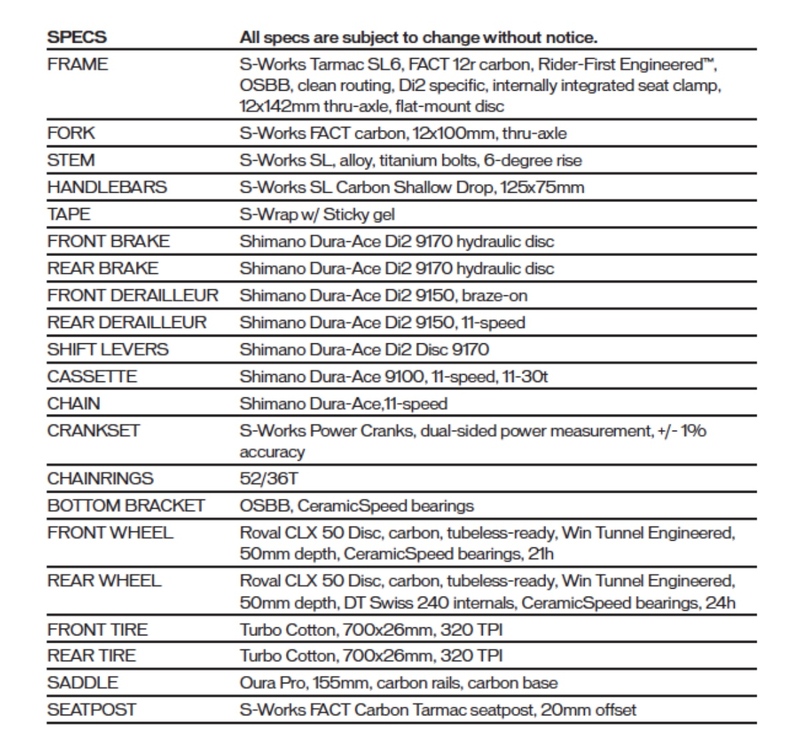 Specialized Tarmac Disc men’s build specs. 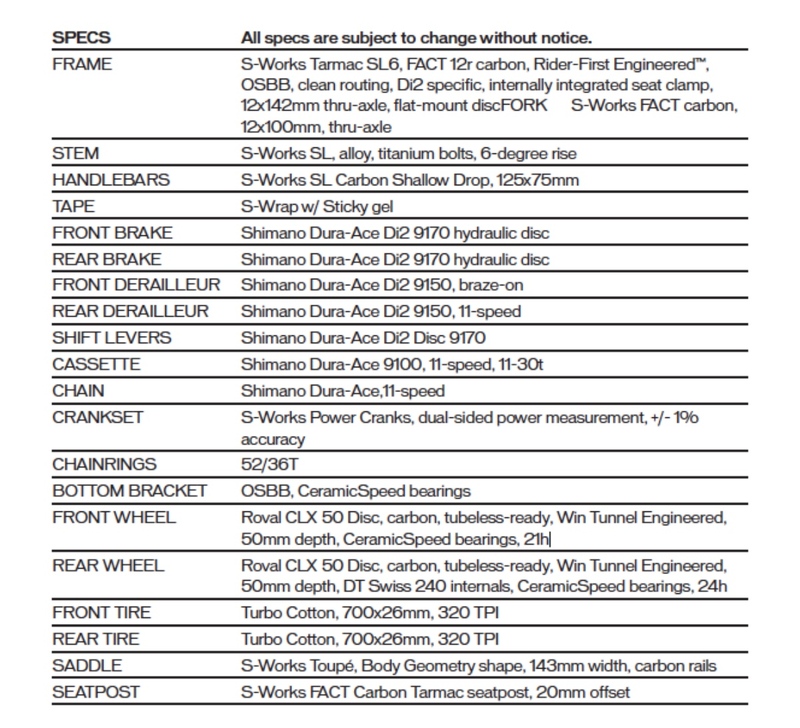 Specialized Tarmac Disc women’s build specs. This bike is also light and fast, says Specialized, which gave RoadBikeReview a quick sneak peek back in February. 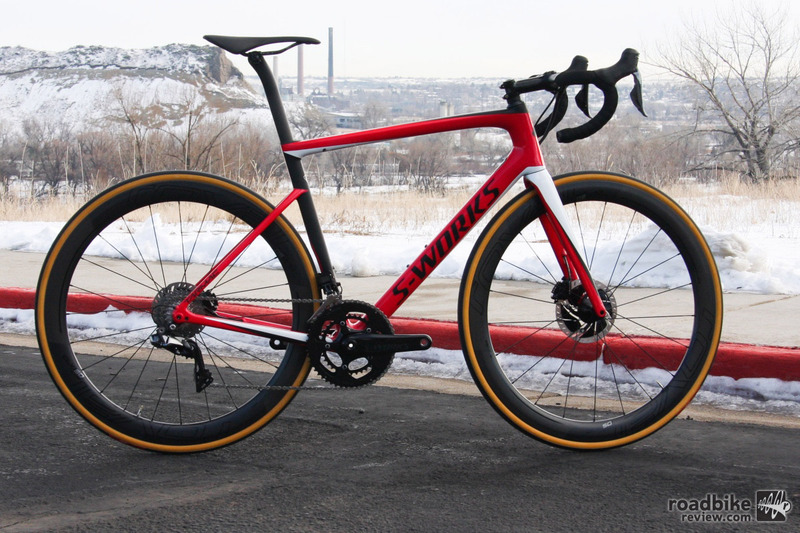 Utilizing upwards of 500 carbon plies, the S-Works Tarmac Disc is billed as the company’s lightest frame, coming in around the 800-gram mark, they say. It also continues to implement Specialized’s rider first engineering, which simply means that subtle lay-up changes are made in the various frame sizes so as to deliver the same ride quality across the line, rather than say a really stiff size small, but a more noodly XL. Read RoadBikeReview’s First Ride Review of the Tarmac SL6 rim brake bike, which shares frame technology with the newly released disc-brake equipped model. Save for slightly longer chainstays, the bike’s frame is essentially identical to its rim brake-equipped cousin. 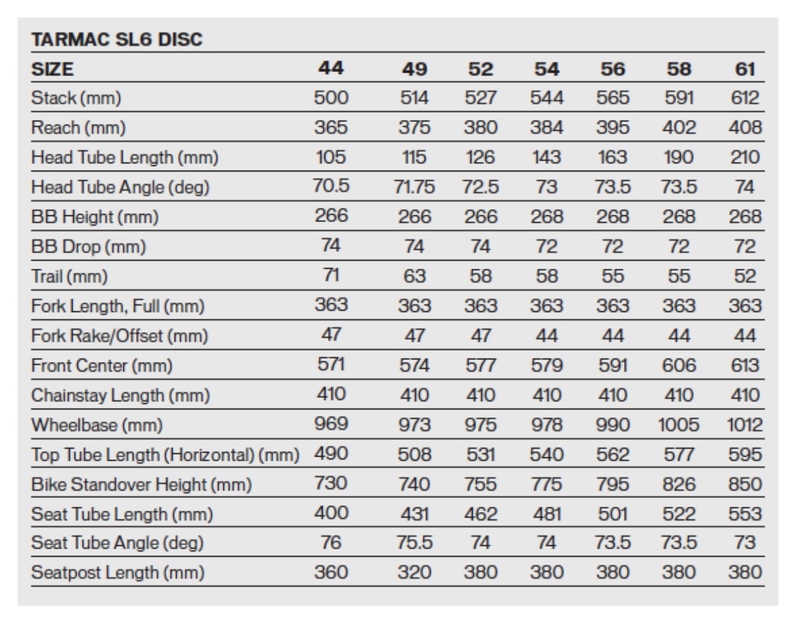 Size options for what is officially known as the Tarmac SL6 Disc are 49cm, 52cm, 54cm, 56cm, 58cm, and 61cm. Women can choose from 44cm, 49cm, 52cm, 54cm, and 56cm, and there are three different fork sizes used within all these sizes to further nail handling characteristics, which as you’d expect are billed as snappy, fast, and stable. Geometry is the same for both men and women (and only the 410mm chainstays differ from rim brake model at 5mmm longer). Otherwise the geometry is identical between rim and disc and men’s and women’s, with only touch points and frame color differing. Here’s the complete geo chart. Specialized Tarmac Disc frame geometry chart. Specialized also claims that testing in its cheekily named Win Tunnel revealed no aerodynamic penalty when compared to the rim brake-equipped Tarmac. Other features of the frame include 12mm thru axles that are thinner, meaning they are flush to the frame on either end. It also has flat mount disc brakes, and a D-shaped seat post that has been “tuned”, which is said to deliver a touch of backward flex at the top of the post to smooth out rough roads. 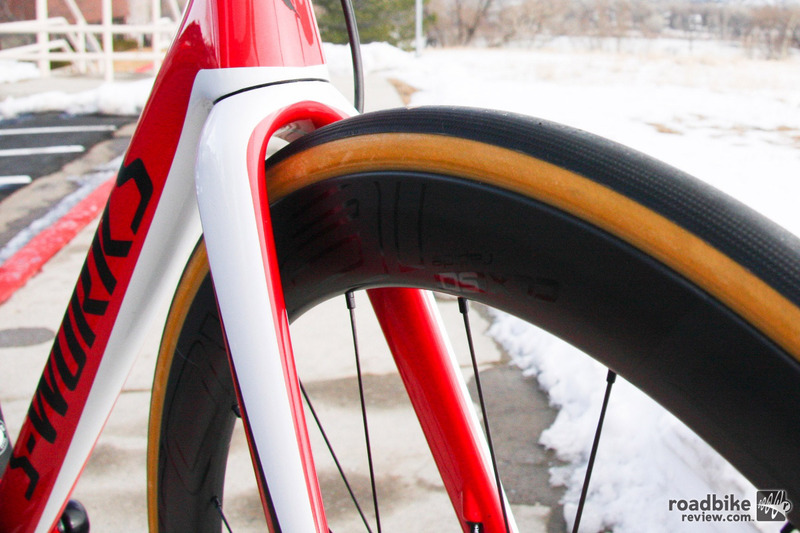 You can further soften your ride with clearance for up to 30mm tires, through the stock setup is 26mm 320tpi S-Works Turbo cotton clinchers. 12mm thru axles are flush to the frame, minimizing drag. Overall bike weight for the $11k build is claimed to be 14.65 pounds size 56cm, which compares favorably to the analogous rim brake bike at 14 pounds even. (And remember that includes the powermeter). Of course, that’s with the lightweight paint. Choose something besides black-silver and your ride will gain about 150 grams. To learn more, click over to page 2 of this post for an extensive FAQ on the new bike, and log on to www.specialized.com. 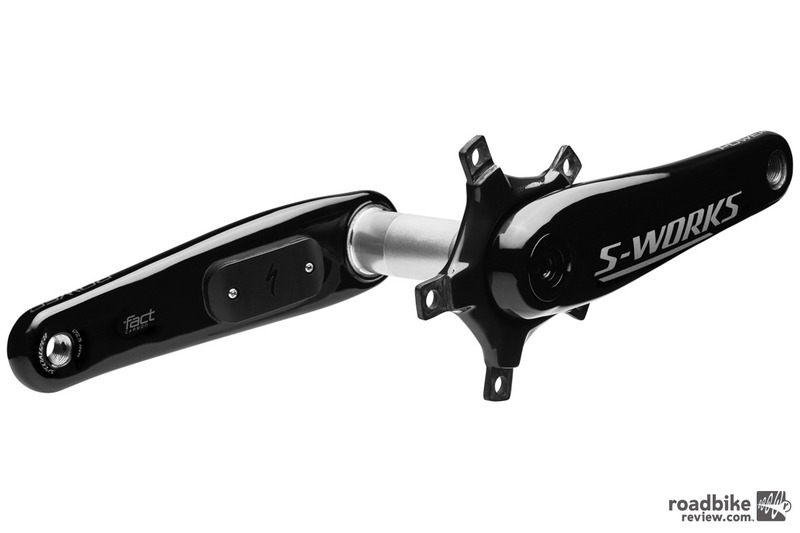 Meet the new S-Works Power Cranks dual-sided powermeter. As already mentioned above, these top-end builds come stock with Specialized’s just launched S-Works Power Cranks dual-side-measuring powermeter, which gives the Big Red S the distinction of being the first major bike maker to have its own powermeter. Though it must be noted that they’ve partnered with 4iiii in the manufacturing of some of the internals. This giant treadmill was integral in validating the new meter’s accuracy. The project was about 3 years in the making, with a focus on accuracy across all riding scenarios. That quest for near-perfection actually led to an about face on the original launch date, which was supposed to be late last summer. But some issues with thermal drift in the carbon cranks sent the design team back to the drawing board and only now have they been released to the wider world. University of Colorado professor emeritus Rodger Kram, an expert in quantifying human locomotion, led the validating team. The project also led to one of the more interesting test setups we’ve encountered. 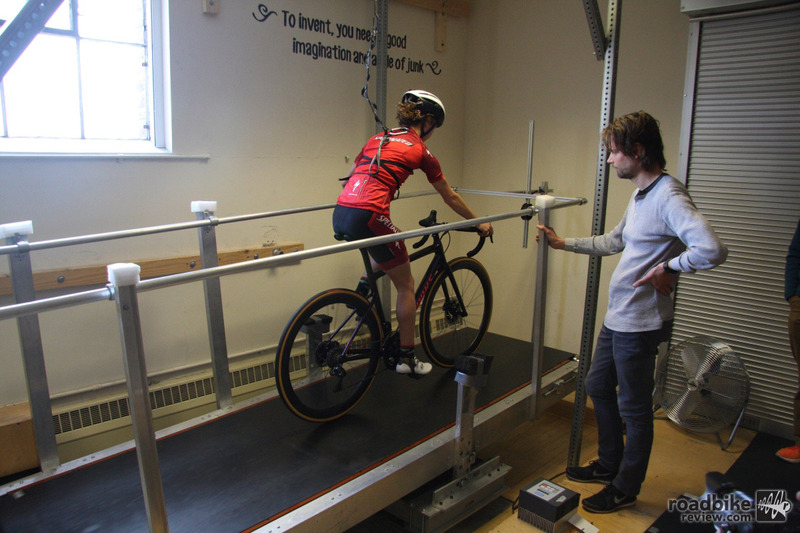 Partnering with University of Colorado professor emeritus Rodger Kram, an expert in quantifying human locomotion, Specialized funded the building of what amounts to an oversized treadmill for bikes. 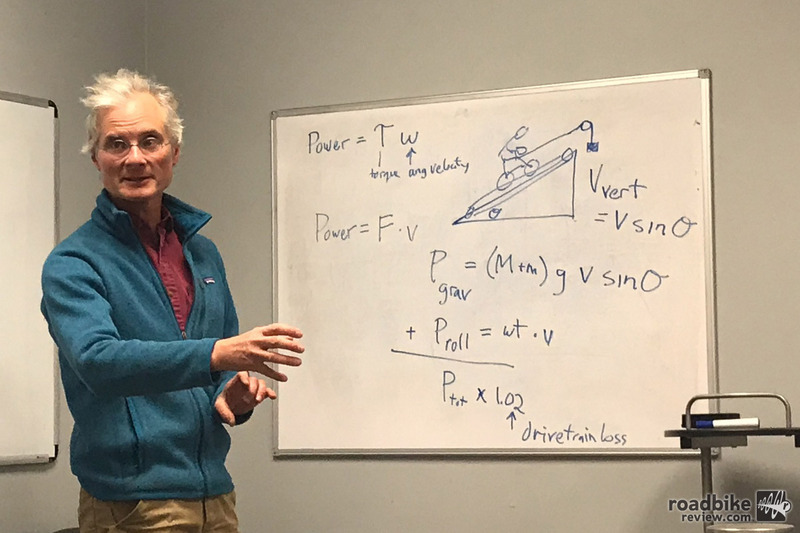 The driver was that instead of simply relying on a dyno to measure accuracy, they wanted to be able to test their new meter in more real world conditions using this force-measuring treadmill that’s located on the CU campus in Boulder. 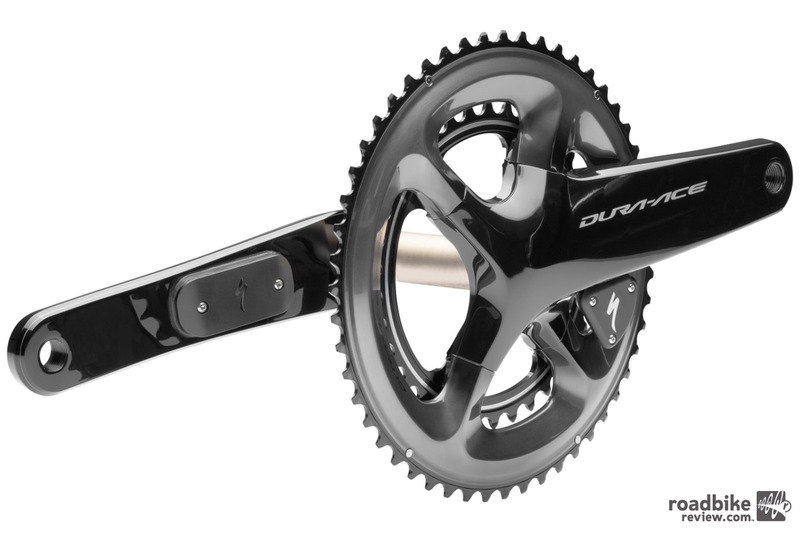 Aftermarket options will include a dual sided Dura-Ace model. Without going too far down the mad science rabbit hole, Specialized says the project allowed them to verify accuracy and that their new meter by looking at rider and bike weight, drivetrain efficiency, tire rolling resistance, gravity, and speed, while also taking into consideration other factors such as cross chaining, cadence changes, and temperature fluctuations. What it found is that their new meter “is the most accurate on the market.” RoadBikeReview obviously can’t verify that claim at this point, so take it however you like. But safe the say the giant treadmill and the work that went into this project was undeniably impressive. 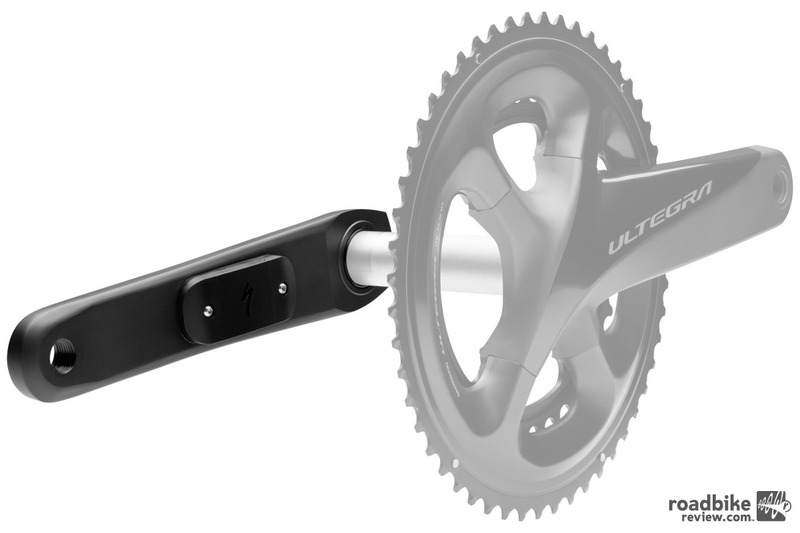 There will also be a single-sided Ultegra upgrade. To learn more, power over to www.specialized.com.